Picture the scene – a dark stage with a single spotlight shining down on one microphone. A woman, of around 20 years old, dressed in jeans and a faded t-shirt, stands to the mic. She erupts into poetry, flooding the audience with truths and confessions, her inner most fears and societal observations. This is the art form that has taken America by storm and is cautiously finding its way into British culture – slam poetry. The language of slam poetry is both colourful and uncensored. It is free from the rigidity and constraints of traditional poetry and it takes the form of free-flowing natural verse. 1This linguistic form is rapidly changing the landscape of poetry. 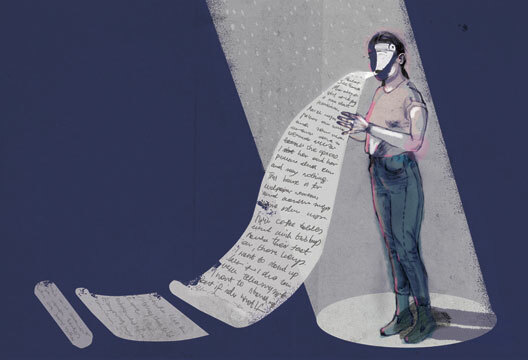 It straddles the border of literature and theatre, allowing the writer and the audience to experience words in a way that makes them whole and free from the often malleable more subjective nature of impersonal and occasionally redundant words on paper. Social injustices are enacted and are brought to life in a dynamically challenging and energetic way. In the 2009 book The cultural politics of slam poetry: Race, identity, and the performance of popular verse in America, Somers-Willett contends that slam poetry presents with a range of performative aspects: '…vocal dynamics, physical dynamics, appearances, setting, hoots and hollers from the audience itself'. This form enables the writers – or rather, the performers – to convey their message in a way that is not constricted to the black and white of text on paper. The psychological mechanisms at play in the act of slam poetry are vast. Self-expression, emotional capacity and the pursuit of meaning in contemporary culture are all in force when enacting a slam poem. Indeed, the ability to recognise emotions and to explore and guide these through the modality of poetry is a trait indicative of high emotional intelligence (EI). Empathy, interpersonal dynamics and expressions of self are all linked explicitly to EI (Mayer, 2008). Promoting EI cultivates a culture of self-awareness, empathy and sociality which all in turn can aid the resolution of ignorance-based stigma and conflict. Poetry, particularly the expressive nature of slam poetry, can also be a method of catharsis. The topics discussed in slam poems often come from a place of discomfort or distress. Social and health psychology tell us that seeking meaning from stressful experiences can be a highly effective coping strategy – known as ‘meaning-focused coping’. Moreover, the social support structure present at poetry events indicates ‘social coping’ (Brannon & Feist, 2009). Uchino (2009) identified social support as being an effective method of stress management, reducing its physical effects. A supportive audience can also greatly improve self-esteem, something which can have a ‘pervasive and powerful impact’ on human emotion, behaviour and cognition (Campbell, 1993). In an editorial entitled ‘Who Killed Poetry?’ Joseph Epstein (1988) claimed that the imminent extinction of poetry is inevitable due to the fact that the form is rarely appreciated outside of a limited subculture audience. Yet slam poetry is revolutionary due to its accessible and liberal nature. T. S. Eliot (1921, p.148) also remarked that ‘It appears likely that poets in our civilization, as it exists, at present, must be difficult’. This implies therefore that historically poetry was a medium employed to be impressive and exclusive. Slam poetry celebrates exaggeration; it revels in excess and vivid language that is often censored in other arenas. It is wonderfully creative and its message is best delivered from a captive and animated narrator. Perhaps these same characteristics are hallmarks of the most successful psychologists? Slam poetry challenges the view of traditional pen-to-paper verse due to its unrestricted and unapologetic nature. It has no distinct form and shuns many motifs historically prescribed to poetry such as rhyme and regular rhythm. If literature and arts can be malleable and adapted to suit the receptors of its audience, I wonder whether the scientific and empirical field of psychology could and should follow this revolution? Can this relatively new style of spoken word poetry change the way we, as psychologists, behave and communicate? How often is our message lost because we are too concerned with the form it is taking? I remember my first undergraduate research paper, that I failed because I strayed too far from the path which had been put in place. I understand that universal structures and guidelines can ensure consistent levels of work and clear communication of ideas – but I ask, with poetry and literature in mind, is this always the case? What degree of structural flexibility can psychology allow whilst maintaining scientific validity and credibility? How much room for creativity and bending the rules is there in the empirical world of psychology? I write as a student of psychology and a lover of literature, and find myself somewhat torn between the styles of these two arguably contradictory realms. Mair (2012) proposes that contemporary psychological research is based heavily on the pursuit of concrete facts and objective data. It is argued that an alternative view to psychology is rather than gathering data to prove or disprove hypotheses, psychologists should be ‘searching to create understanding’. I would contend that this is a critical hallmark of poetry too. A poet has a hypothesis of the world – a way in which they view our culture and behaviour. They use their words to convey this hypothesis with the intent of encouraging thought and debate. Isn’t that identical to what a good psychologist does? May (1975) discusses poets as being ‘delightful creatures in the meadow or garret, but they are menaces on the assembly line. Mechanisation requires uniformity, predictability and orderliness’ (p.69). Arguably, this is where the distinctions between poetry and psychological science end. Some elements of psychological research rely on the precise, the uniform and the orderly. Although poetry may be at times wonderfully elusive and open to interpretation, the same, admittedly, cannot be said entirely for psychology. When dissecting the actual critical elements of ‘science’, one can evaluate the parallels between this and the creative arena of the arts. Key features of science include empiricism, objectivity, control, replication, predictability. I would protest that although these aspects are present in the study of human mind and behaviours, subjectivity will remain present throughout the majority of psychological research and debate. Find me two psychologists from two differing approaches that agree on every research paper and I will dispute that. Until then, I am very much of the opinion that differing opinion and subjectivity is the basis in which we build our theories and ideas. In the same way that poetry is built on a single idea, psychology is too. Poetry is governed by subjectivity and the very nature that no two interpretations are alike. But Psychology is governed by differing explanation and variants of opinion too. Discussion and debate are at the heart of both of these forms, and yet they are often treated as mutually exclusive. I think of my lecturer advising on how to write a good title for our first year research project: ‘Don’t try and do anything too clever’. Or a tutor giving feedback on an essay saying ‘it reads like you’re studying English Literature’ (I believe I was supposed to be offended). I believe this is an outdated view of what Psychology is or should be: it now takes so many forms, encompasses so many disciplines, that there is surely room for personality, passion and poetry at the table. I have spent countless hours huddled in front of my glowing laptop screen in the dark watching slam poets parade around the stage like superheroes, fearlessly calling an end to female oppression and sexual objectification and any other current issue that strikes a chord with the writer. Their weapon of choice is their words. The same can be said for some academics I meet at University: I cannot help but draw parallels between these two very different performance arenas, and long may those parallels continue. • Belissa Escoloedo, Zariya Allen and Rhiannon McGavin in ‘Somewhere in America’ discussing education system in America: “The greatest lessons are the ones you don’t remember learning” (Brave New Voices, 2014) .
. Find her on Twitter. She has also just set up a new blog, Thought Bubbles. Campbell, J. L. (1993). Who am I? The role of self-concept confusion in understanding the behavior of people with low self-esteem. In Self Esteem: The Puzzle of Low Self-Regard (pp. pp 3-20). Springer, US. Eliot, T S. (1921) The Metaphysical Poets. Epstein, J. (1988). Who Killed Poetry?. Commentary, 86, 13. Mair, M. (2012). Enchanting psychology: The poetry of personal inquiry. Journal of Constructivist Psychology, 25, 184-209. May, R (1975). The Courage to Create. New York, NY: Viking. Mayer, J. D (2008). Human Abilities: Emotional Intelligence. Annual Review of Psychology. 59: 507–536. Somers-Willett, S. B. (2009). The cultural politics of slam poetry: Race, identity, and the performance of popular verse in America. University of Michigan Press. Uchino, B. N. (2009). Understanding the links between social support and physical health: A life-span perspective with emphasis on the separability of perceived and received support. Perspectives on Psychological Science. 4. 236–255.